When last we met, my family had just spent a couple of days wandering by car, foot, and boat around Bar Harbor, Maine, and Acadia National Park. Once I’d done enough lunges up the sides of mountains, we packed into the car and headed north through the spruce-fir forests of New Brunswick to Prince Edward Island. Brackley Beach area of Prince Edward Island National Park. 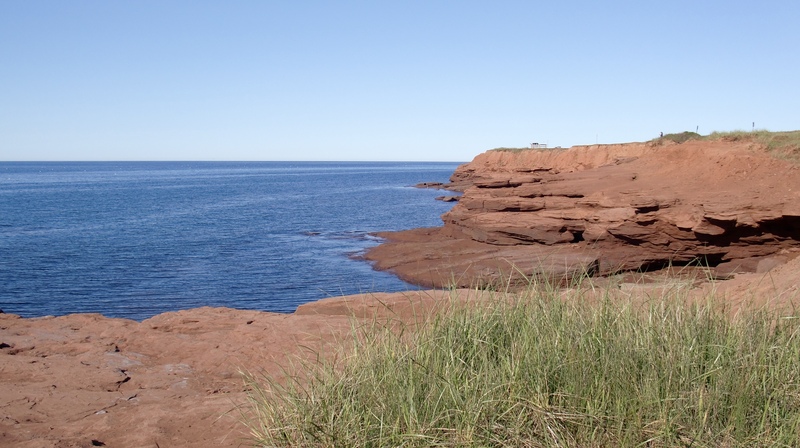 When I tell you that I’ve been wanting to go to Prince Edward Island since I was twelve years old, you will probably know what triggered my interest in Canada’s smallest province and the birthplace of Confederation. If you don’t know the connection between PEI and twelve-year-old girls, don’t worry; there are some clues coming up. We spent most of our visit at Prince Edward Island National Park. 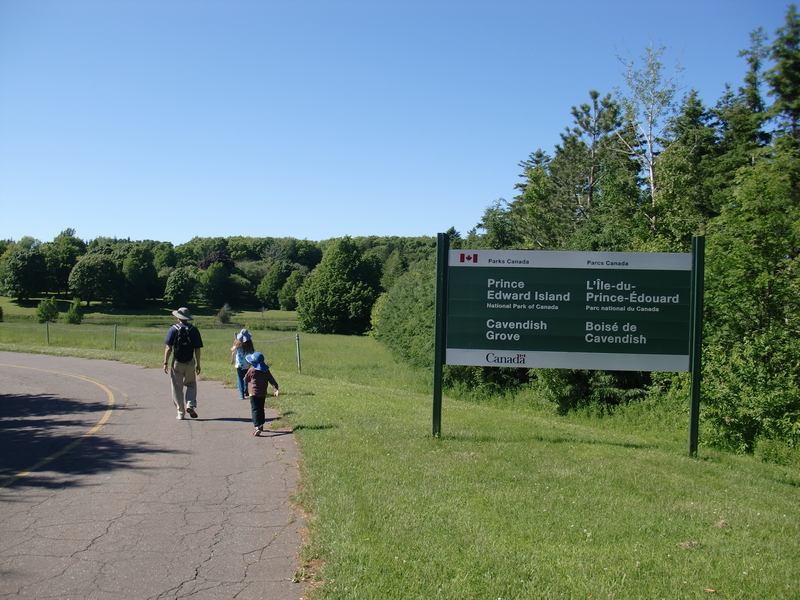 The park is split into three areas, and we stayed in Cavendish, the most touristy part of the island, in a cottage that was easy walking distance to the western-most section of the park. We got the touristy stuff out of the way first. We visited the birthplace of Lucy Maud Montgomery in New London, the site of her Cavendish home, her grave in Cavendish Cemetery, and of course, Green Gables, which we reached on foot through the Haunted Wood. Everything in Cavendish is Anne Shirley, Green Gables, and locations, real and imagined, from the books. Indeed, the books pervade most or perhaps all of PEI, but the peak saturation seems to be Cavendish. For those unfamiliar with Montgomery’s work, Anne Shirley is the precocious orphan heroine of a whole series of novels. She is fictional, but her home—Green Gables—was inspired by a real farmhouse. The Green Gables maintained by the Canadian government is that farmhouse. Tons and tons of people visit it, and last week, we were among those tons. I admit to feeling a little strange looking at real stuff inspired by fictional characters, and my spouse and I both felt a little self-conscious when people asked where we were staying. 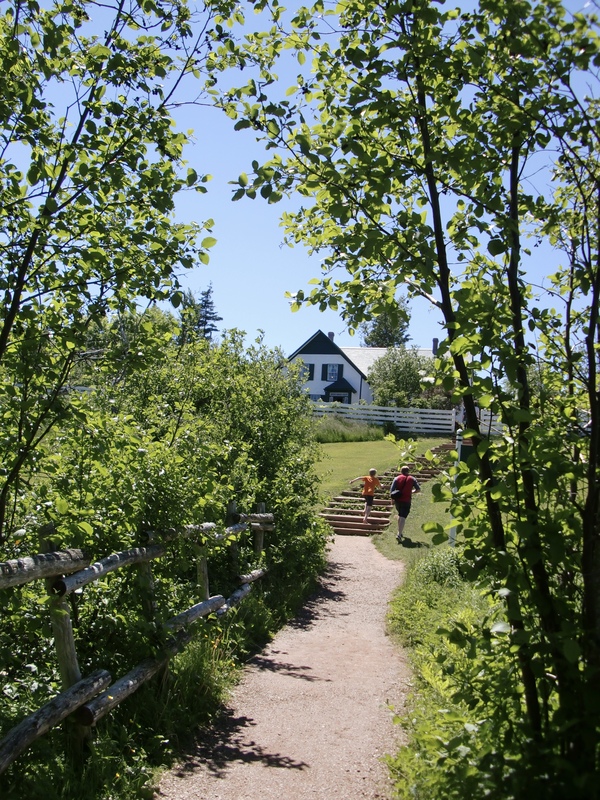 We—I especially—prefer to think of ourselves as “travelers” rather than “tourists.” That’s a difficult line to tread when you’re staying in the Anne Shirley Motel and Cottages (which were incredibly nice, by the way, and the perfect choice for us for this visit to PEI). Once we’d done the Green Gables thing, we set about enjoying the natural spaces of PEI, which were stunning. Acadia National Park is breathtaking on a grand scale. PEI is smaller in scale but no less breathtaking. At an overlook at the Cavendish section of the park. We explored the area of the park closest to our cottage, then the Brackley Beach area. On our last day we drove east to Greenwich Dunes, which if it weren’t for all of the flies and biting insects may well have been the most beautiful of all. Looking towards St. Peter from the trail to Greenwich Dunes. 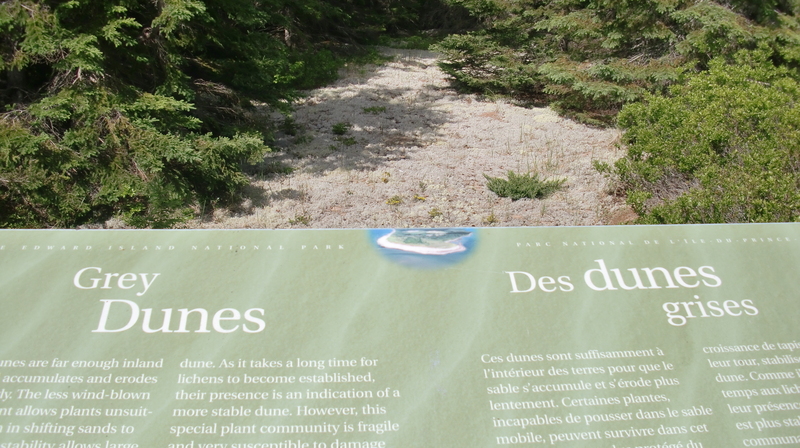 I loved learning about the management necessary to bring back the Acadian forest that was cut down for farmland and about the stages in which a sand dune is formed (and I loved that they spell “grey” with an “e”). On the trail to Greenwich Dunes. 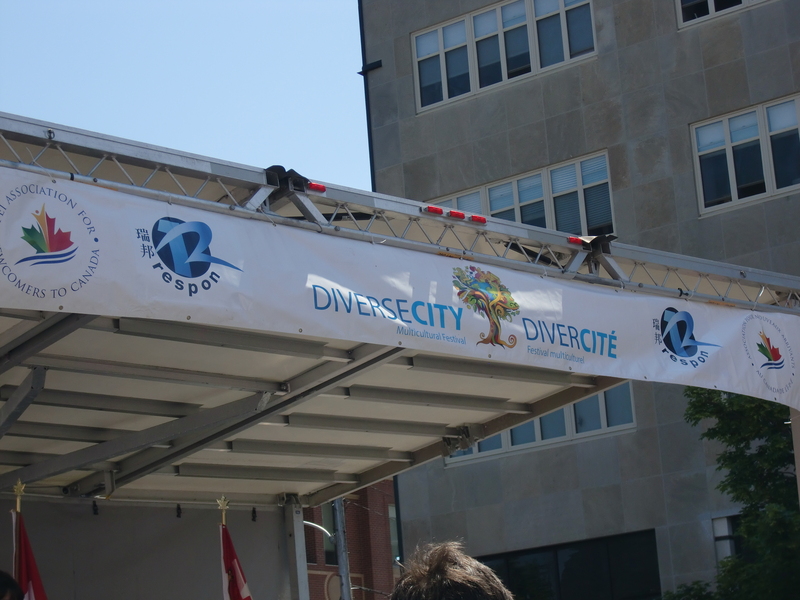 I loved learning about the many cultures that form the totality of the island’s present-day culture and being greeted with “Hello, bonjour!” We happened to be in Charlottetown during their DiverseCity Street Fair and my eyes stung with tears as we witnessed a swearing-in ceremony for new Canadian citizens and I thought about the many paths and hopes that might have led these individuals to this point in time. Citizenship ceremony in Charlottetown, PEI. 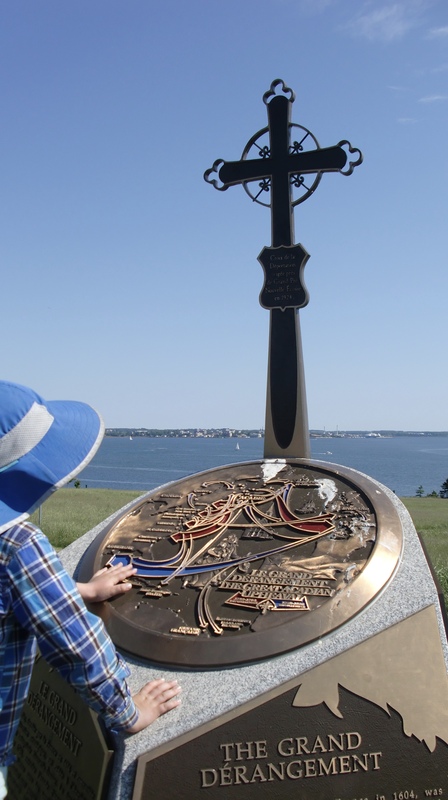 And I fell silent contemplating the displacement of 3,000 French and Acadians when the British defeated the French at Port-la-Joye—Fort Amherst and felt an unpleasant sense of fatality that our species will never really learn to live peacefully for any significant length of time. Lucy Maud Montgomery’s novels were what introduced me to PEI, but it wasn’t just the Anne Shirley thing that brought us to the island. 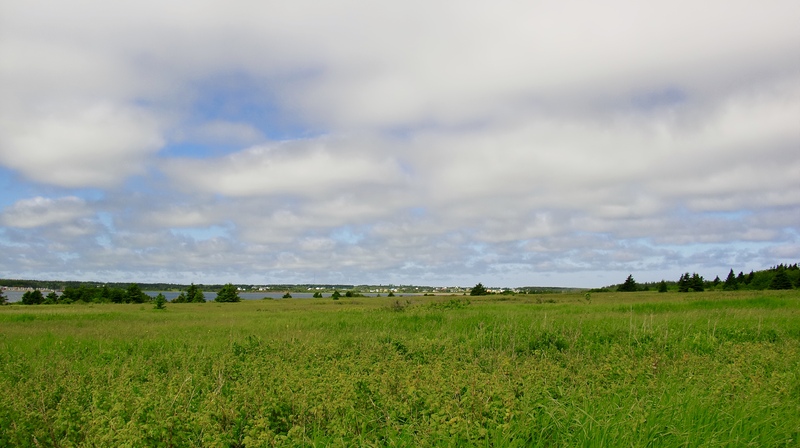 I have long been intrigued by islands and the people and cultures that are supported by them, and I was excited to see how this manifested itself on PEI. As it turns out, it’s difficult in a short amount of time to get a sense for the island under the layer of tourism. We got a bit of a sense by attending a church service in Charlottetown on Sunday and by talking to non-tourists as much as we could (or rather, as much as my spouse could because I am hopelessly stupid and self-conscious talking to strangers, particularly when I’m embarrassed to admit that I’m from the U.S.), but we didn’t even scratch the surface. Forget-me-nots along the Haunted Wood Trail. A “big bunny” (we think a snowshoe hare) in Cavendish. 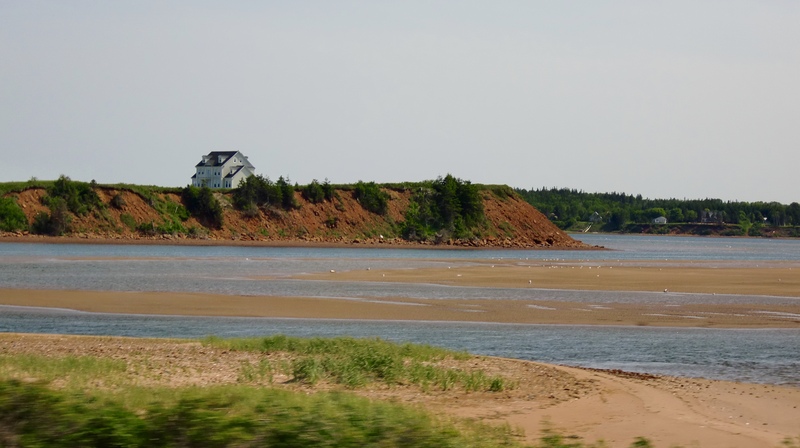 The beach at North Rustico. Self-portrait at the beach at North Rustico. From the top of the Greenwich sand dunes. Confederation Bridge on the way back to New Brunswick. At 12.9 kilometers (8 miles) long, it’s the longest bridge over ice-covered waters. I know what you’re saying, Ellery. I kept putting my camera away thinking I’d already captured the best photo that area had to offer, but then I would turn around and see another view and think, “Holy crap! That’s even more amazing!” and have to get my camera out again. It helped that we had phenomenal weather while we were there. I wish I’d done better at bringing home what the fields looked like. I just couldn’t do them justice with my little camera.